What is a Landlord's Gas Safety Certificate and Why do I Need One? If you are a landlord and you let rented accommodation with a gas supply, then you have legal responsibilities regarding the safety of the gas appliances, pipework, flues and chimneys that you provide for your tenants. You must provide your tenant with a record of your Gas Safety Checks, and the most common way is to use a Landlord's Gas Safety Record (LGSR) which is often referred to as a Gas Safety certificate or CP12. You need to make sure that all flues or gas appliances are safe for use by having them gas safety checked every 12 months, and any problems found must be properly rectified. Both Gas Safety Inspection and rectification work must be carried out by a Gas Safe Registered Engineer, such as RNS Plumbing and Heating, who will issue you with a Gas Safety Certificate once the inspection has been successfully completed. 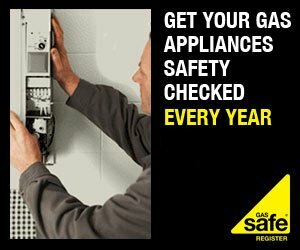 It is advisable that gas appliances are maintained or serviced regularly by a Gas Safe registered engineer. It is also recommended that you fit a Carbon Monoxide Detector alarms in all areas where a gas appliance is situated. RNS Plumbing and Heating are Gas Safe Registered and can provide a full Landlord's Gas Safety Inspection. We can also provide full diagnosis and rectification in the event of there being any problems found during your Landlord's Gas Safety check. What is involved in a Landlord's Gas Safety Inspection? To book a Landlord's Gas Safety Inspection, please click the following link to use our online form.